As every motorcyclist knows, those two wheels quickly become more than just a form of transport, they become the owner’s pride and joy. That’s why it’s essential to keep them under cover at all times, as the British climate can quickly lead to disfiguring rust. 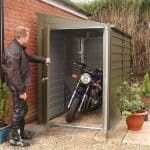 This compact metal garage from Trimetals is specifically designed to solve this problem for motorcycles, but we feel it could also be used as a secure and high quality garden storage unit. 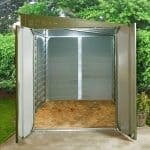 The most about thing about a motorcycle storage unit is that it has to be weather resistant, and that’s certainly achieved here. The pent roof quickly carries rain or even snow away, and the thick wall cladding is also very effective at stopping water penetration. 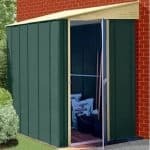 It’s made from galvanised metal which is then topped with PVC to make it extremely rainproof, and the overlap design means that rain simply bounces off or runs away. Of course, security is also essential when something as valuable as a motorcycle is being stored. That’s why we were glad to see that a secure key operated lock is included as standard. It’s a reassuring and value adding feature, whatever this versatile metal building is being used for. 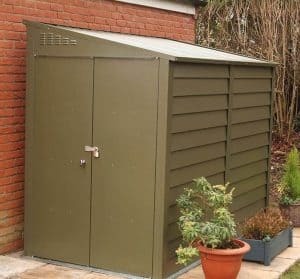 This pent roofed metal shed is designed to be used as a compact garage that’s perfect for motorcycles and scooters, and it carries out this function perfectly, but it’s so well built that we can easily imagine it being used for other purposes as well. 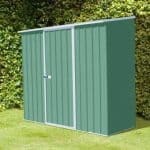 The addition of stand alone shelving units could, for example, turn this into a secure garden shed. Whatever it’s used for we found it quite attractive, thanks to the dark green colour scheme that helps it blend into a garden environment. The pent roof itself is functional without being obtrusive, in that its pitch quickly channels rainwater away rather than allowing it to sit on the surface, and it adds a little extra height so that a motorcyclist feels comfortable when pushing their bike inside. The ridge height created is 2.04m and the eaves height is 1.74m. The overall width is 1.37m, on the side featuring the door, and the overall depth is 2.65m. 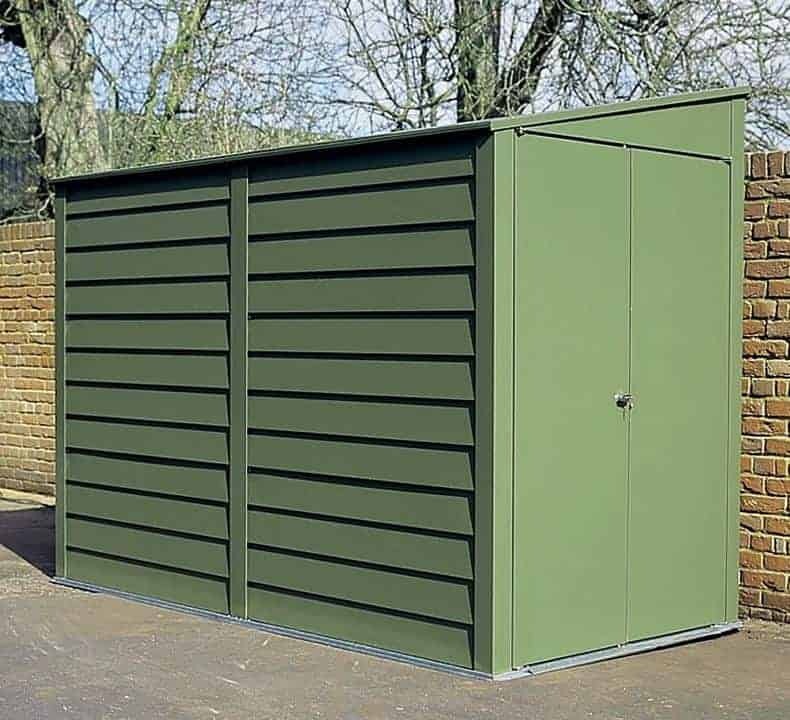 Whilst we have seen wider motorcycle garages, this is more than enough for a typical motorbike as long as care is taken when manoeuvring it inside. 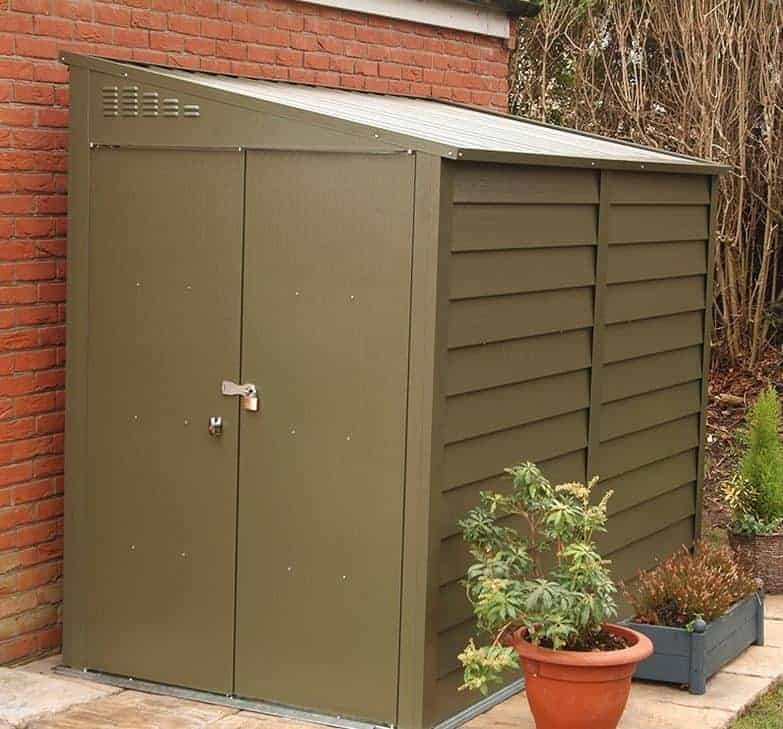 We were very impressed by the cladding used on this garage as not only is it made of galvanised steel, which is itself very strong and rigid, it’s then coated in PVC. This means that water can’t reach the metal itself, giving it excellent weather protection. 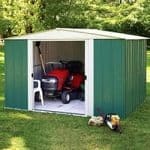 When assembled the structure feels reliably sturdy, so you won’t have to worry about its performance in windy conditions. Another advantage is that the substrate is fire resistant to class 0 and 1, which is always an important consideration when there’s petrol and machinery about. There is no floor attached, which is as we’d expect with a metal garage of any size, so you’ll need a level concrete area upon which to affix it. With such high quality cladding used, and extra weather protection provided by the pent roof, we had expected a long warranty period to be provided, but even so we were pleased to see a long 25 year warranty against rust perforations supplied by Trimetals. 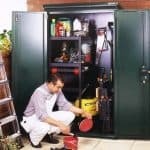 This is the longest warranty period that we see on garages and sheds we review, and shows just how much confidence the manufacturer has in their product. Another benefit of this garage, of course, is that it requires no future treatments and very little maintenance other than cleaning from time to time. There are no windows to this garage, but one useful feature that is present is built in air vents. This helps to stop the buildup of condensation that can quickly occur when a hot motocycle is deposited into an enclosed space. The door providing access to the garage is 1.16m wide, but one problem we found is that it swings shut after opening which means that you’ll need something to prop it open, such as a brick, while you move your motorcycle inside. We feel that the lack of windows is itself an important safety feature, as it means that passers by will have no way of knowing whether the latest Ducati or Yamaha is stored inside or simply a few tins of paint; this makes it much less likely that intruders will attempt to break in. We were pleased to see that this is backed up by an even more important security feature in the form of a key operated lock. It’s strong and sturdy, and provides real peace of mind for motorcycle owners. Whilst the lock itself provides a good level of security, it was good to see that this can be boosted still further by one of the optional extras available with the garage. For a price of £24.49 an infrared alarm can be added, and for £47.99 an extra hasp and padlock can also be yours. 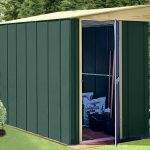 There are also options to add a wooden floor and a workbench for people who want to use this building for alternative purposes such as a mini workshop or a garden storage shed. The addition of a PVC coating to the already tough galvanised steel substrate shows the attention to quality provided by Trimetals. This is a very tough and durable building, and it was good to see confirmation of this in the shape of the 25 year warranty period. 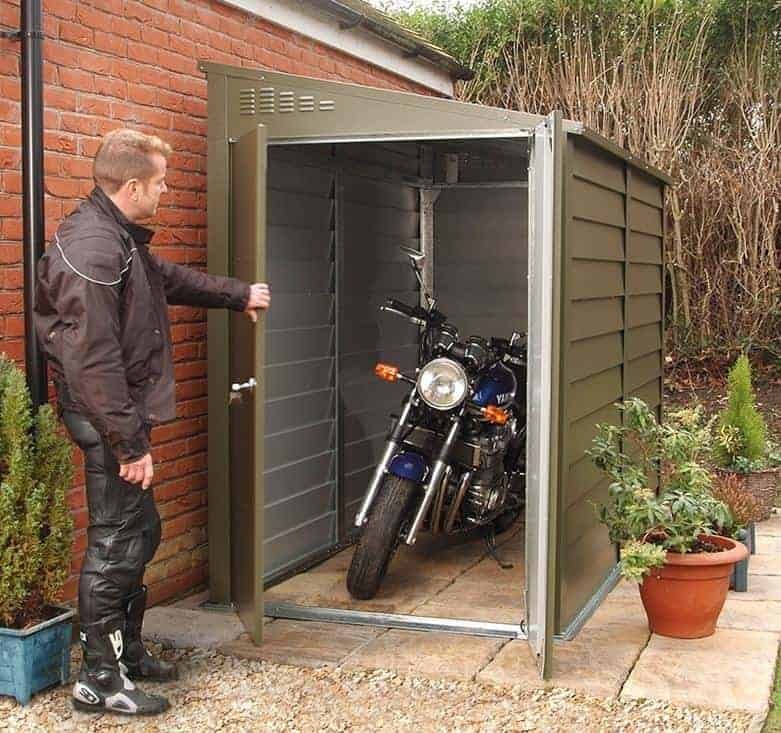 This is one of the smaller motorcycle garages that we’ve reviewed, but there is still plenty of room to store a motorcycle inside as long as care is taken. With all fixtures and fittings included this is a relatively easy building to construct. With a friend’s help, expect to take around five hours. This is a solid and durable motorcycle store, yet we have reviewed other options that are considerably cheaper. Final Thoughts: What we liked most about this attractive yet tough looking metal building is that it can be used equally well for two distinct purposes. 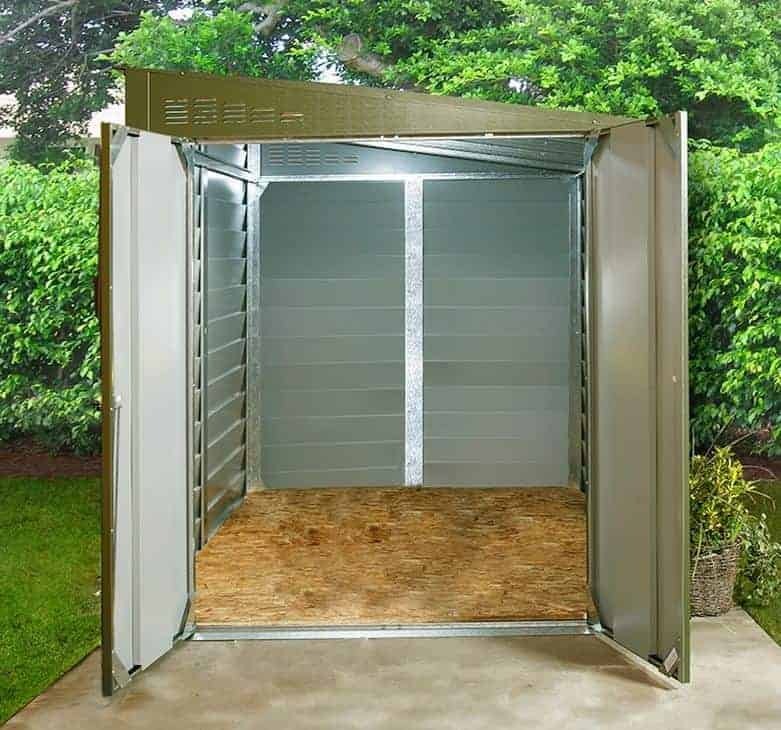 It’s an excellent choice as a motorcycle garage, as it’s highly effective at keeping rainwater out, has ventilation to keep condensation at bay, and is fire resistant. 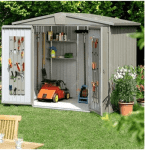 It can also, however, be a very practical mid sized storage space for the garden, or even with the addition of lighting and maybe a workbench a miniature workshop. The integrated locking system will prove invaluable for both of these functions, and it was good to see that further security measures could be added if desired.